Small multiples: thriving or surviving? Small multiples are growing and exploring life outside the NHS, but they are still far from being in an ideal position in 2019’s financial climate. “I thought I was too young to retire,” says David Evans, chief pharmacist and managing director at the East Midlands-based small multiple Evans Pharmacy, when he is asked why he held on to 10 pharmacies during the sale of a much larger 65-pharmacy chain three years ago. Since setting up the new business in February 2016, Evans has acquired two more pharmacies. One had been in the pipeline for a long time and the other presented an opportunity to work closely with a GP surgery. And he is on trend. In contrast to the big multiples, their smaller counterparts (those with 6–99 pharmacies) have increased their hold from a 12.61% market share to 13.30% (a net increase of 92 pharmacies [see Infographic]). Despite this, however, you won’t find Evans celebrating. Evans was able to finance the acquisitions using family investment. Banks are still prepared to lend, he says, but they are starting to ask more questions. Peter Cattee, chair of the Association of Independent Multiple Pharmacies and chief executive of PCT Healthcare, a chain of 118 pharmacies, has a long history of buying and selling branches. His company grew significantly in 2016 when he acquired Evans’s family business. “We took over the business two months after the government announcement [on funding cuts in England in December 2015] but [the purchase] had started 18 months before that when pharmacy was in a different place,” Cattee explains. Evans is scratching his head. “If the big multiple can’t make it work, how’s the small multiple going to make it work?” he asks. Having a head office close to branches is something that can give small multiples an edge over larger companies. “If something goes wrong, it’s easier for me to mobilise and offer support to those branches,” says Ahmed. Cattee agrees: “The ability to manage pharmacies is inversely related to your distance from them. There is so much local variation that contractors need to be a local expert.” Having geographically concentrated businesses with local networks is one way that small multiples have reduced their financial risk, he explains. The relative success of small multiples, “if success is the right word”, says Evans, comes down to a better critical mass and a flexibility around innovation. “Independents don’t necessarily have the pooled resource of a small multiple, and large multiples are too inflexible,” he says. And when businesses are unable to forecast, it becomes increasingly difficult to know how much money will be available for investment. Cattee suggests that, under such extreme pressure, contractors may be forced to compromise on quality when trying to strike a balance between that and cost. “Businesses have no choice — they’ve taken on long leases, taken on debt and they need to meet these commitments,” he says. “But it can only be to the detriment of both patients’ needs and the development of our profession if we are forced to concentrate solely on the price of the service. Cost containment is an important business strategy across all sectors, suggests Cattee, but there is little inefficiency that can be driven out. So far, Evans has resisted any reduction in his branch opening hours but says it is something he will need to consider for one or two of his pharmacies. Several competitors no longer open at the weekend, which has shifted some Saturday trade his way. “We’re … sitting it out and trying to gain market share from reductions in other people’s service and from closures,” he says. Despite the challenges, some investments are being made. Evans has invested in a central robot for dispensing into monitored dosage systems. “That allows us to moderate the work flow at each branch.” He is also investing in staff and making better use of the skill mix available to him. He employs around 20 pharmacists; 40% of whom either have, or are working towards, postgraduate qualifications. Evans has two surgery-based pharmacies among his portfolio. “We second staff into both surgeries to work at a clinical pharmacist level. It’s really good for multidisciplinary working and working relationships,” he says. Many small groups are also looking at new revenue streams to supplement their income and profitability. Service provision is an important area of growth for Imaan Healthcare; the company is focusing on conditions that are particular issues in the areas it serves: diabetes, COPD and mental health (see Box). It needs to prove its worth before commissioners will take it seriously as a service provider, which requires investment and strong relationships. Imaan Healthcare’s prediabetes service has got off to a good start in Oldham and now attracts funding from the clinical commissioning group (CCG). Pharmacists connect with their local communities, visiting libraries, football matches, churches, mosques and other public areas, where they provide HbA1c and cholesterol point-of-care testing. Individuals considered to be at risk of developing diabetes are referred to the NHS Diabetes Prevention Programme. The company now plans to approach local authorities and CCGs in Derby, Hounslow and Preston, where diabetes is also a significant issue. Imaan Healthcare is developing a private urgent care clinic with medicines supplied either under a patient group direction or via prescriptions written by pharmacist independent prescribers. “We’re targeting working patients who don’t want to give half their day or a full day over as annual leave just to go to see the doctor,” says Ahmed. Another possible income stream is through online over-the-counter (OTC) medicine sales, but Evans says the return is minimal. “We’re seeing a few thousand pounds of [online] OTC sales per month but that only generates, say, £400 worth of income; it’s a drop in the ocean.” And any increase in sales from NHS England’s policy of restricting prescribing of OTC medicines has not been forthcoming. “That’s not a revenue stream as far as I’m concerned,” he says. 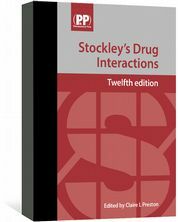 Now in its twelfth edition, Stockley’s Drug Interactions is still the most comprehensive and authoritative international source of drug interaction information. 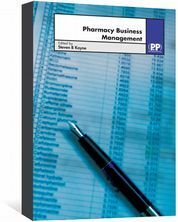 Explains the financial, legal and marketing aspects of pharmacy business management. 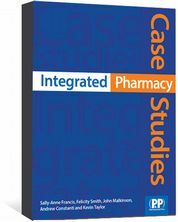 Case studies illustrate practical applications. An introduction to the basics of accounting and financial management. Applies these principles to pharmacy practice.